Vignette windows are designed to close and open effortlessly with an easy touch which means that you barely have to wake from your restful slumber to close the shades and sleep in just a little longer. In this setting, the side panels mounted on a traverse rod can be completely shut creating absolute blackout conditions when needed. 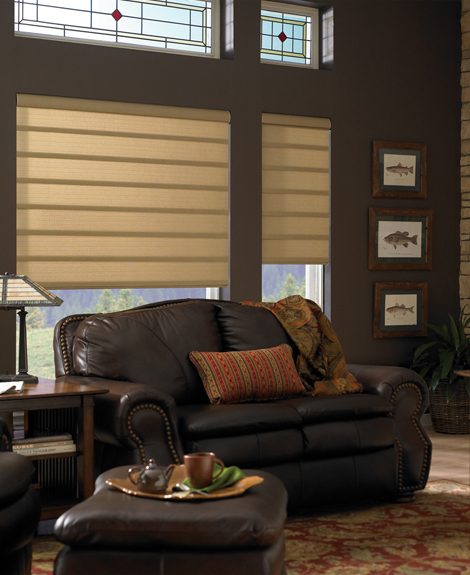 These modern vignette shades have removed the need for unsightly, dangling cords and add a distinctively tiered look. In this setting, their light coloring offsets the rest of the room without contrasting so drastically as to be shocking. Side panels mounted on a traverse rod can be decoratively tied back or closed for complete darkness. 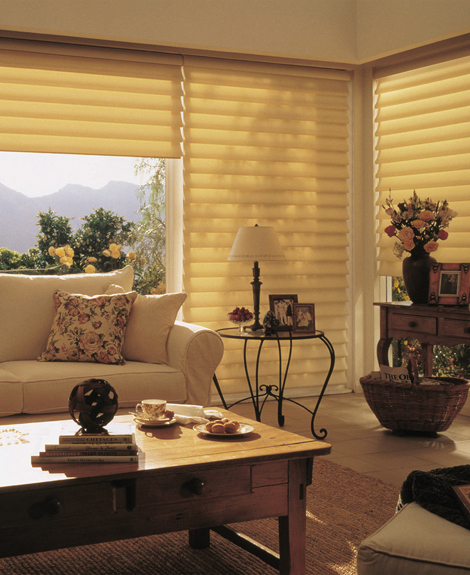 With an amazing view such as this, you may well leave your vignette shades completely open in order to take in Mother Nature’s beauty and warm sunshine. 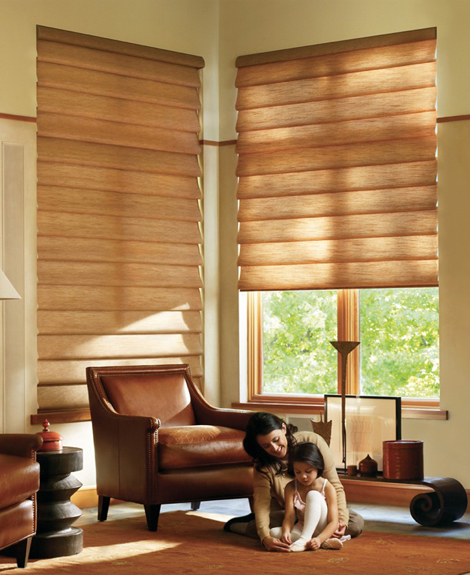 By closing the lower portion of the shades and leaving the tops open, however, you can still enjoy the sunlight but assure your family’s privacy. 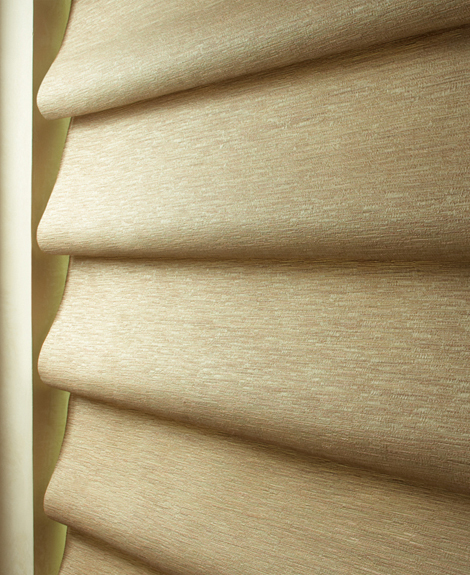 These stunning vignette window shades have been beautifully crafted and utilize a modern design that allows them to roll up into the headrail, providing a clean finish and sleek horizontal lines. They are aesthetically pleasing from both indoors and out, thanks to a distinct feature that does away with grommets, cords, and gathers. 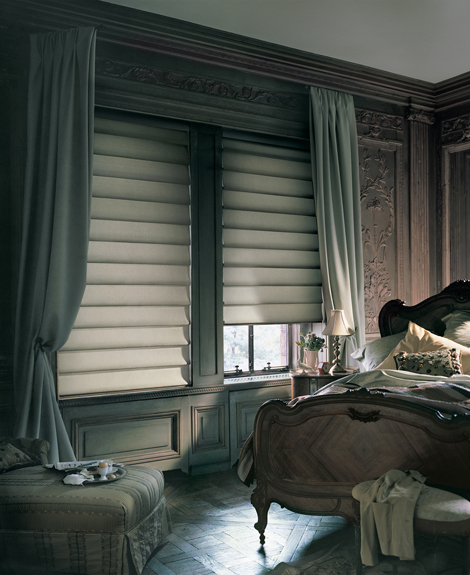 This majestic view can be fully appreciated by raising your vignette shades all the way up. But if you desire a softer, more filtered lighting effect simply lower them to the floor. 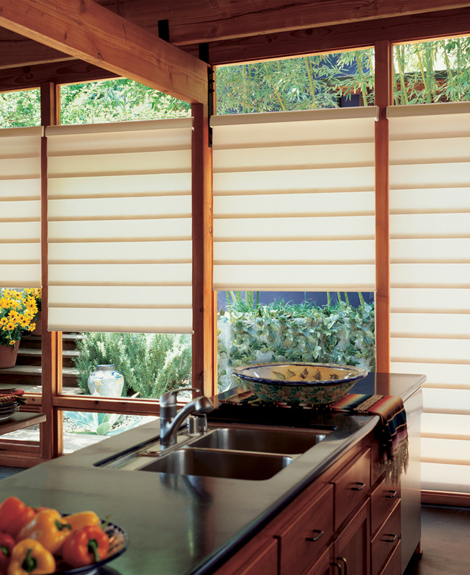 With shades this aesthetically pleasing, there is no need for bulky cornices, gathered valances, or yards of heavily draped fabric. While these side panels are basically for show only, they do soften the corner of the room which, along with the filtered light provided by the vignette shades, makes this setting warm and cozy. 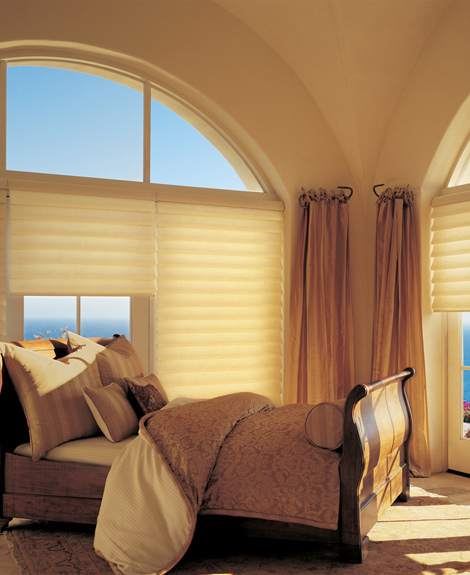 Leave the arched windows open and airy, as seen here, or treat them with fitted shutters if so desired. 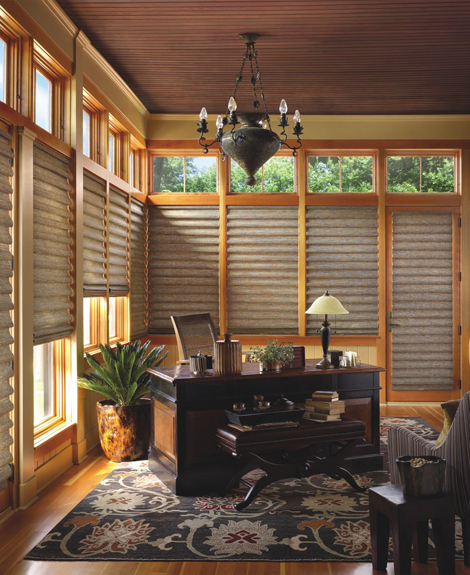 These beautiful vignette window shades not only match the wood tones of the floor but have been designed to be lowered from the top or raised from the bottom, depending on your need for privacy and from where you want your light source to originate. Or fully appreciate the view by opening them wide. 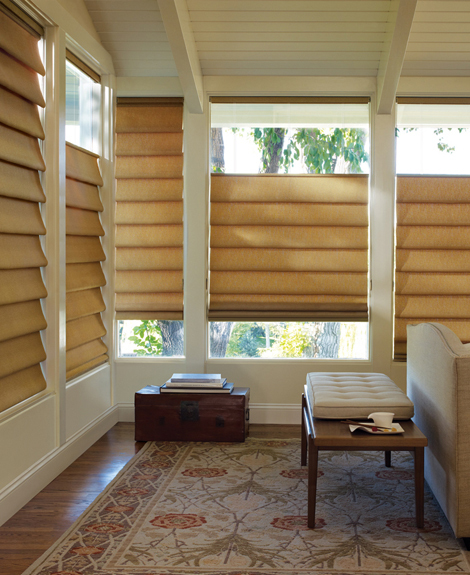 Vignette shades can be tailored to fit not only your lifestyle but your home. Here the color has been customized to bring out certain tones found in the area rug. And while they have been extended to cover the door window as well, the transom windows have been left untreated to allow plenty of bright sunshine. The wood tone of these vignette shades ties in perfectly with not only the window frames but the flooring and upholstery as well. Though some softly filtered light does enter the room, even with the shades closed, you may wish to open them (at least partially) to enjoy the warm sun and take in the view.